Nissan wants a 10 per cent US market share in 2016, according to Jose Munoz, chairman of Nissan North America, speaking recently at the J.D. Power Automotive Summit in San Francisco. Nissan saw sales last year climb 11.1 per cent to 1,386,895 units (including Infiniti) and light-vehicle share rose to 8.4 per cent, marking the twelfth annual gain in the last 15 years. According to Munoz, Nissan can lay claim to growth driven by the company’s investment in North American vehicle and powertrain production capacity, its new-product assault over the last four years and its strengthening dealer body. Nissan builds in North America 85 per cent of the vehicles it sells in the US in North America, with capacity of some 2 million units annually split evenly between the US and Mexico. This year Nissan will roll out a redesigned Maxima midsize sedan and redesigned Titan full-size pickup powered by the new Cummins ISX5.0 diesel engine. Munoz told delegates the new Titan plugs the last hole in Nissan’s US product lineup. He claims that with multiple powertrain options – including a diesel – and body-style configurations, the model now covers 90 per cent of the full-size pickup sector. Munoz has set modest targets for new Titan, projecting a five per cent share of the segment for the new truck. This mirrors the share it recorded a decade ago when it was launched. “But not to be in this segment would limit our ability to achieve our (overall 10% market-share) goal,” he added. Nissan is hoping that with its new diesel-powered Titan it will begin to walk tall with the likes of Ford, General Motors and Fiat Chrysler. Certainly, thanks to the long-term perseverance of Cummins Inc. (which has been developing – but not producing – diesel engines with compacted graphite iron (CGI) vee cylinder blocks than most people can remember) Nissan will be able to offer a CGI diesel engine alongside Ford Motor Company (with its 6.7-litre V8) and Chrysler with its VM Motori 3-litre V6. Of course, Cummins has been producing diesel egines since 1927 but it is the first time it has made a CGI vee diesel. 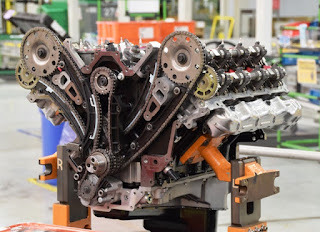 The 5-litre ISV5.0 V8 diesel with double overhead camshafts and two-stage turbocharger is currently in pre-production mode, gearing up for a promised launch by the end of this year. Nissan announced two years ago it would use the 310 bhp Cummins V8 in its all-new Titan XD, allowing the Japanese company to make its first attempt to edge into the heavy-duty pickup sector. 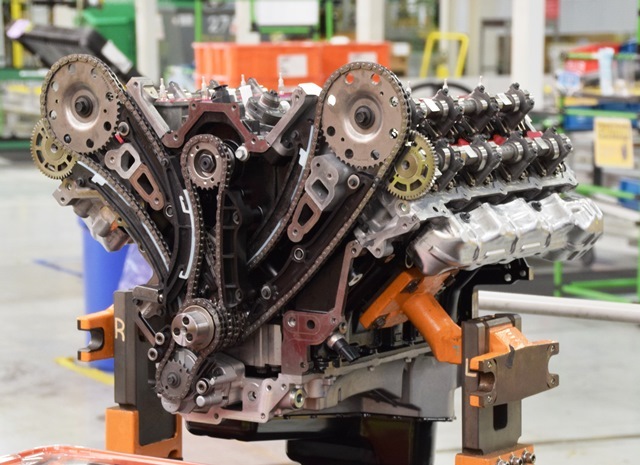 While the news helped bolster Nissan’s standing in the world, it also came as a thankful blessing to Cummins executives, some of whom may have wondered if they were ever going to find a customer for their diesel. The same executives may have mulled the idea they had made a huge mistake in pushing for a CGI diesel. With a torque rating of 555 lbft. (752 Nm), the Titan XD will outperform by a wide margin (at least on paper) every other light-duty pickup Detroit has to offer, including Ford’s 3.5-litre EcoBoost V6 and 5-litre V8, as well as GM’s 5.3-litre and 6.2-litre V8s and Ram’s VM Motori 3-litre EcoDiesel V6 and 5.7-litre Hemi V-8. Added to which, the ISV5.0 is a ‘new’ engine, taking on board all the latest design and technology that Cummins engineers can throw at it. Nissan can also breathe easy knowing that Navistar International had to come on bended knee to source Cummins vee diesels (but not so far CGI diesels) in the wake of the Lisle-based truck and engine builder falling short of EPA regulations with its in-house made engines, thanks to a lack of foresight by deposed chief executive Daniel Ustian. Cummins claims the ISV5.0 goes beyond the traditional diesel attributes of horsepower, torque, reliability and durability to deliver “the next dimension of performance”. Cummins global diesel design expertise has combined advanced materials, the latest High Pressure Common Rail (HPCR) fuel system, Cummins VGT Turbocharger and Cummins emission control technology to produce an extraordinarily clean, quiet and fuel-efficient V8 diesel engine. The Columbus company says the ISV5.0 is ideally suited for pickup and delivery vehicles, school buses, light- and medium-duty trucks and motorhomes. And Cummins commitment to service support has never been stronger. “That’s taking total performance to the next dimension,” it adds. It has been reported that early, low production began a few months ago for non-automotive customers such as Tiffin Motorhomes, and the same assembly line, with annual capacity of 150,000 engines, will produce the Nissan version as well. According to wardsauto.com, truck customers needing more torque from Detroit brands had to step up to heavy-duty diesel pickups that are heavier and more expensive but capable of pulling horse trailers and mobile homes. It adds that in Nissan’s eyes, many truck buyers don’t need to tow quite that much and want an alternative. Rich Miller, Nissan’s chief product specialist for Titan, claims the new engine is intended to “fill the diesel white space” that exists in the market. Nissan has promised the Cummins V8 diesel will be able to tow at least 12,000 lb. (5,443 kg). wardsauto.com thinks that number seems low, as GM’s 6.2-litre V8 (rated at 460 lbft [623 Nm]) and Ford’s 3.5-litre EcoBoost V-6 (with 420 lbft [569 Nm]) have reached that threshold already. Nissan has yet to reveal the Titan’s selling price. Just how much customers will have to pay for the Cummins diesel option at present remains a mystery.